Graded discussions are attached to an assignment. As an assignment, they can be graded and factored into your students' final grade for your course. As a discussion, they operate much like a regular discussion, but with additional options for grading. This lets you create a graded discussion that is attached to the course. If need be, you can later connect it to a lesson. Go to the Course > Assignments view. When you get to the Type field, choose Discussion. A new drop-down will appear, letting you choose either to create a New discussion or to select from any existing (non-graded) discussions. If you create a new discussion, the discussion will have the same name as you give the assignment. If you choose an existing discussion, the assignment's name will change to match the discussion's name. 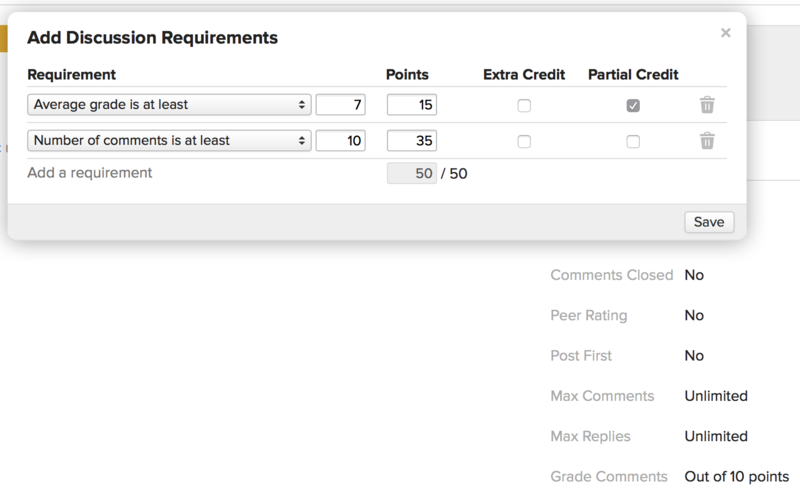 You can choose a rubric for the discussion assignment; you can also choose a rubric if you enable grading for comments and replies. You'll need to adjust its settings and add grading requirements for it on its page. An entry will appear for it in the course Gradebook. The Feedback view works just as it does on any other assignment. When you click Enter Grades, you'll see how the student scored on each of the grading requirements you set up for the discussion (if any). What is the difference between a comment and a reply? I would hazard that a comment, presumably, introduces a new thought or tangent to the discussion; a reply interacts with a comment. Functionality-wise, comments and replies can be used as separate grading requirements; also, replies are nested under the comments with which they're interacting. Is that helpful? Does the "Get Email Updates" send an email to the instructor or to all on the discussion? Would love to see this info on graded discussions become one of your faculty videos. It's always helpful to link that to faculty. Thanks! What happens if auto grade is not activated, and you assign a grade to each discussion post. Does that grade then NOT show in the gradebook? on Populi my grade adding up right will you please, go and check it for me. Our students often upload their discussion using the assignment tab rather than going to the discussion board because there is a place to do so. Perhaps when a discussion type is selected, the option to upload a file could be removed. We have an instructor who requires 1 comment (original post) and 2 reply posts. If all three posts are met, the student earns full credit. If students only complete part of the assignment (say they make 2 replies but never posted an original comment), they are not supposed to get any credit for the assignment. He is attempting the auto grading feature, but from the above, I don't see anyway to accommodate this parameter. Is checking the "partial credit" box going to be of any help? 70% of the grade applies to meeting the requirements for the number of posts (auto-graded). 30% of the grade applies to **my **evaluation (not peer evaluation) of posts - a grade that I can enter. There doesn't appear to be this option. Brad, not exactly, but I think we can get pretty close to what you're talking about doing. Check out this image for reference. I created a graded discussion worth 50 points. I set Grade Comments to yes, with each comment graded on a 10-point scale. For requirements, I assigned 35 points to the students' posting the minimum number of posts (5 in this case). I also assigned 15 points for the average comment grade being at least 7 points (out of the 10 points I specified in the Grade Comments setting). So, that's one scenario... you kinda have to sort out the 70-30 split on your own, but it does appear to be doable. One instructor desires and "all or nothing" grade, and I haven't been able to give him what he wants. For example, discussion is worth 10 points. They either supply one comment and two replies, or they get zero. All I have been able to do is make one comment worth 5 points, and 2 replies worth 5 points, with no partial credit for either. But what happens is if they do one comment and no replies, they get 5 points instead of 0, How can you make the system know, when there are two components (comments & replies) that all components must be filled to get any points? @Brad: The student will be able to see individual grades on comments and replies, but he will not see any sort of "running" overall assignment grade. @Michelle: There is no all-or-nothing option at this time. You should consider graded discussion requirements as something like questions on a test—the student's performance on individual questions adds up to a total test score. I would like to reiterate Wendy's comment. 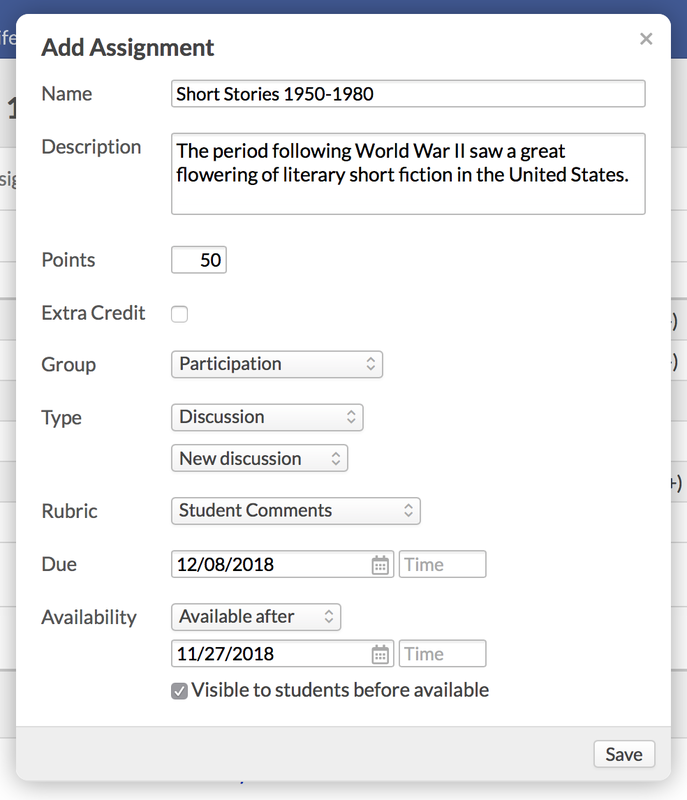 Because graded discussions show up on the assignment page, students often click on the assignment rather than go to the actual discussion post. The same happens when graded discussions are linked to lessons. When they do this, they are directed to the grade/feedback page for the assignment. Students who post their discussion questions here are obviously not participating in the actual discussion, and their work is not graded. Also, unless the instructor goes searching for it, he doesn't see the student's comments. We have given our students instructions, but inevitably, some still end up in the wrong place. Could there possibly be a pop-up box that appears giving them a choice to go to the actual discussion or to the feedback page - at the very least a warning that the page they are heading to is not the actual discussion board? Is there any auto grading criteria that counts total number of posts without distinguishing comments from replies? If not, could that be added? I don't want to assign a different grade to comments vs replies ... I just want to count posts of either kind without distinction. I don't see that option in any of the "all posts" criteria. Is there any way to make separate due dates for the initial comment and the replies on a single discussion post? For instance can we make a comment due on Monday and then the replies due by the following Wednesday? In response to Lucas' request, we too have an instructor that wants the initial comment to be due on a certain day (to give other students a chance to read and select it for a reply post) and a later due date for the replies. @ Brad - they seem to have implemented your request. Rather than selecting comments or replies, there is an option to select a # of posts. Is there a way to get ALL discussions emailed without having to enter each week and tick it? I am a grader for discussions only, for over 50 courses. Doing this each and every week is a little tedious. Am I missing how to set email alerts for discussions for an entire course? Are the grades in the discussions not linked directly to the grades in the gradebook? In other words, if you change a grade in the discussions, what happens to the grade in the gradebook? @Jonathon, Not really. The grading interface for discussions basically gives you the information you need to grade the student—but still requires you actively come up with a grade yourself. Auto Grade has Populi calculate a grade at the date/time you enter, but it doesn't dynamically calculate the grade before/after that moment. Are students able to see the grading requirements set for the Auto Grade? What about the stats? Is the requirement set for the Total Word Count accumulative or for each individual post/comment/reply?